I had quite a few people ask me what I thought of Addison Russell’s grand slam in game-6 of the 2016 World Series. So I set out to do an Addison Russell grand slam video analysis the next morning. …10K frames per second, where you can see every wrinkle on a players uniform, AND face!! So enjoy this video analysis and please post any comments, questions, or concerns below. Knee Action at landing and during the turn. 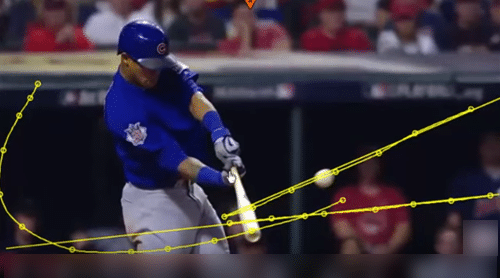 This is great, one thing – from the side view – is that, at impact, Russell’s hips seem to be past perpendicular and another thing, from the front view, Russell’s turned his back heel up so that the foot direction’s more down than perpendicular to contact. Minor things, and probably related, but I love your note to the effect that it’s really important not to get tweaked about whether an element of the swing is “perfect”. Getting the feel of being perpendicular and athletic seems more important than micromanaging a kid’s swing. On another front, do you have a video I missed about the flashlight/barrel prep? I’ve been fighting this in my older guy’s swing – he loves to wrap the bat – and this example is beautiful but I’ve not been able to establish the cues that stick on this point. Alan, I agree, optimal impact will have belt buckle perpendicular to impact, it’s not always the case because we’re dealing with timing issues. I’ll have to do a video on the knob flashlight (keeping barrel up) drill. Basically, I set a bucket lid down where the catcher’s feet would be and tell the hitter to keep the “flashlight” pointed at the lid as close to landing as possible. I forgot, the one question I did have is whether you looked at the hook in Russell’s top wrist? After looking at/for the finger pressure you noted, I followed the hands and that struck me as kinda weird. Keep ‘Back Foot Sideways’ Like Robinson Cano? What Do You Think About…?